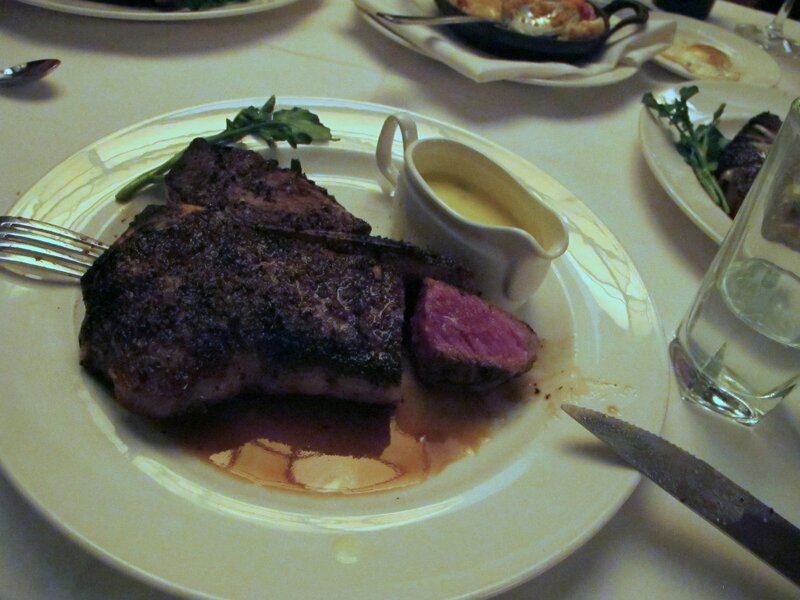 Pleasures of the Table: Capital Grille - Got Beef? 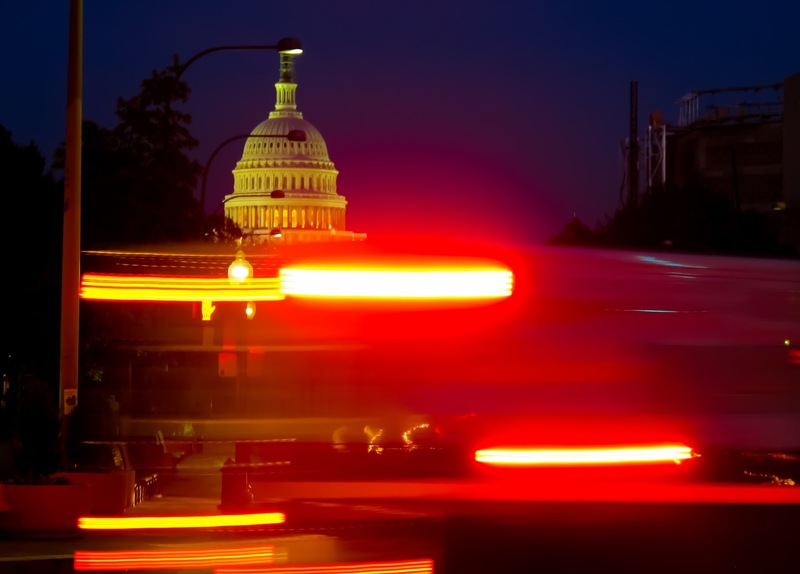 Washington DC is home to some flashy folks, some fast-talking politicians, and some great places to go talk about your latest power-play with well heeled friends. The Capital Grille is one of the places to have that discreet, yet celebratory conversation. It's apparently good for families too, as I found out when I had the opportunity to eat there last week. My friend Jason and I hung out at the bar waiting for our third. I had a Manhattan and Jason went with a very dirty martini. Good starts. This is executive chef Brian Thomas. He's been with them for quite a while and knows a thing or twenty about beef and wine. The particular bottle we were discussing here is a 2008 Freemark created as a collaborative effort between Freemark Abbey's Ted Edwards and The Capital Grille's Master Sommelier, George Miliotes. For every bottle purchased $25.00 goes to Share Our Strength. When we went to sit down this was on our table. No, that isn't a crayfish, the shrimp around the platter were huge, so perspective is lacking. There were oysters, the lobster, shrimp, and some huge lumps of crab. This was the second course. Two perfectly cooked lamb chops. If you happen to catch Brian at a charity event he's sometimes serving these. Don't pass on them. This was the hot appetizer plate. Nicely prepared Rhode Island-style calamari with hot peppers and garlic, corn salsa, and awesome crab cakes. After this course, I was done. 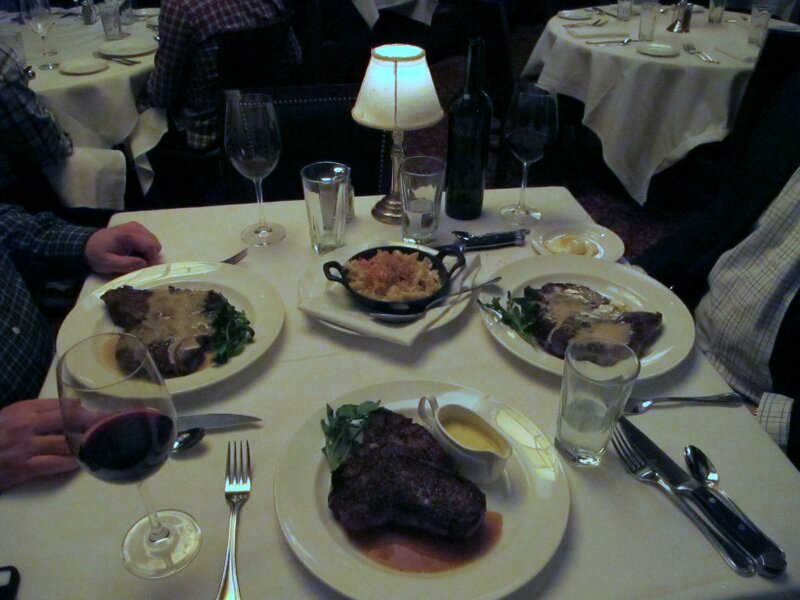 However, we still had the main course to contend with. I'm not sure how many ounces this puppy was, but it was huge. We all ordered the prime, dry-aged porterhouse. I am a bit of a purist with steaks so I got mine with a Montreal rub cooked medium-rare. 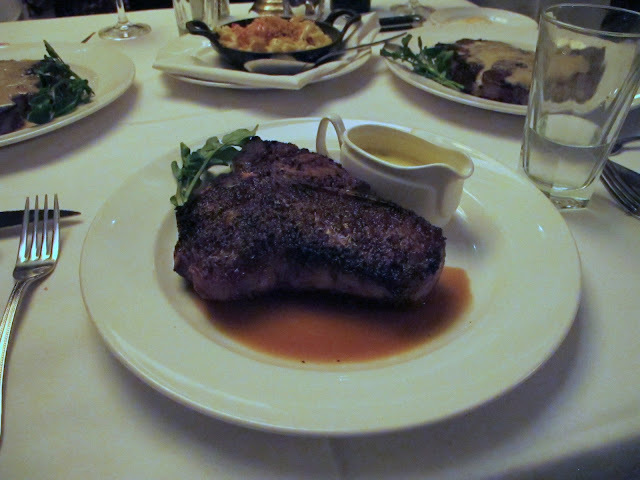 Definitely one of the top steaks I've had in DC. This is what they looked like on the table. Had to throw that picture in for some perspective. A wonderful meal. There were families all around us with young kids (behaving surprisingly well) and everyone was having a good time. As far as restaurants go, memories are made based on more than just the food. The service has an impact as well. The service here was exceptional. Our server was on the money and could read us like only a well-seasoned professional can. He never interrupted us when we were talking, he paced the meal perfectly, was friendly, exceedingly knowledgeable about the food and wine, and was definitely the kind of server that you'd hope to have one of in your own restaurant. From the looks of things there was more than one like him here. It's tough to keep people like that and takes a concerted effort on the part of the management of any company. My hat is off to you folks. Well done. Hope to be seeing you again soon.